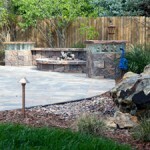 One of our specialties here at Colorado Stoneworks Landscaping is our flagstone patios. We’ll work with you to come up with a pleasing design that fits your yard and budget, and can include things like boulder walls and water features. Take a look at our Patio Portfolio, or watch the following video to see some examples of our work. Contact us to get more information about building a flagstone patio in your yard, or get a free quote. ← Previous Previous post: Should you xeriscape your yard?